Sugar Swings! 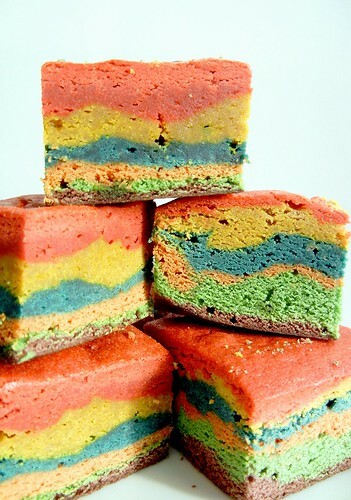 Serve Some: rainbow blondie bars (3 ways).....! 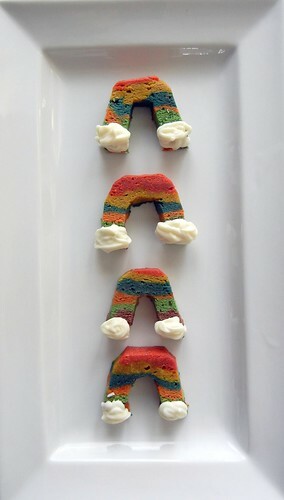 rainbow blondie bars (3 ways).....! ....truthfully i'm not really happy with how these turned out....the colors could have been better...next time i'd use a recipe that isn't as dark to start with (this was really tasty but used brown sugar)....also the air pockets kinda bummed me out when you cut the bars.....probably not a major issue when you do regular blondies or brownies but since i was going for the rainbow look i was looking for it to be more uniform....plus i don't think i got all the brown sugar chunks totally dissolved in the batter either which left some air pockets too....so that's probably a technique thing versus the recipe....and lastly i was hoping for straighter color lines but again easier said then done when layering the tinted batters in....oh well you bake and you learn! .....still linking up to these fun bloghops....hope to see you over there too!...thanks for stopping by and have a great week, and really looking forward to all the st patty's day inspired treats to come....! I've tried making rainbow cupcakes before, and I realize everytime you put some colouring into the batter, it wont perk up as much when you bake. I'm not sure it's just me, or the colouring, or something else. 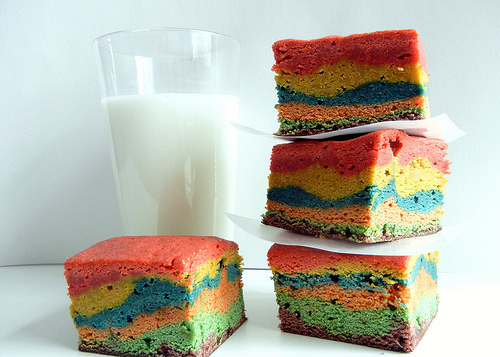 Anyways, the rainbow bars look deliciously yummy! Pretty sure this is the most creative st. Patty's dessert I've seen so far this year! I never thought of turning a blondie into a rainbow. What a fun idea! I think they look great. Looks yummy and I bet the kids go crazy for them--I know my grands would! These are so festive and colorful!!! my head is spinning with your cleverness! I should have known something this creative was yours, Michelle! I LOVE them. 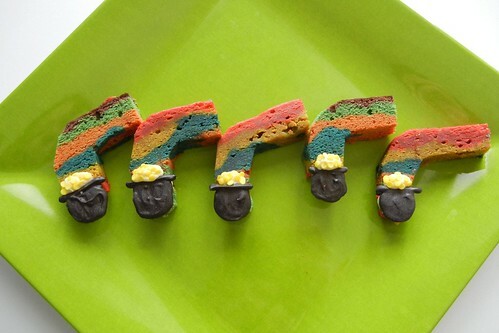 Then you took the blondies a step further by making the other cute treats:) Love the pot of gold rainbows! How cute! I love all the different ways you can use them. 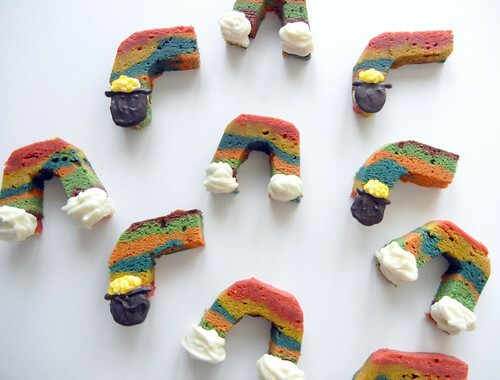 Love the rainbow cut outs! Looks yummy and so fun for St. Patties. Please come share at the Anything Goes linky at Bacon Time fri-monday. I am featuring you tomorrow during Sticker Time. Thank you so much for sharing this treat with me. They are so pretty & colourful... I am sure delicious too. Decorating Challenge in my space with your lovely creations….. I love!! So creative and I think they turned out great. whoopie cookies with homemade rainbow chips....!